It is funny how rulers, oops... ‘democratic leaders’ of the developed world, present themselves as defenders of FREEDOM every time they wish to drive public opinion to support going to war defending other nations’ FREEDOM. Yet for all the talk of FREEDOM, at home we are living in a society where FREEDOM is highly regulated. To illustrate how ridiculous it can get, take England for example; working in an office, you will be forbidden to change a light bulb UNLESS, you have done a training course on how to climb a ladder and have the certificate to prove it. Yes there are laws, regulations, and guide lines for every aspect of our lives, and we are told it is for our own good and benefit, it is there to protect us from ourselves, others, and harms way in general. However often when delving into the nitty-gritty of these regulation, one can’t but help find hypocrisy every step of the way, especially when it comes to regulations concerning people’s health and environmental pollution. We are told that such regulations are based on scientific facts, setting safe limits of exposure to harmful substances and are there to protect human health, society, and the environment we live in, but more often then not, laws, regulations, and guide lines are written in such a vague way, as to allow total disregard to those safe limits when it’s deemed suitable. The IAEA website advices that basic approaches to radiation protection are consistent all over the world. The individual dose limit for radiation workers averaged over 5 years is 100 mSv, and for members of the general public, is 1 mSv per year. It goes on to state - "any additional dose will cause a proportional increase in the chance of a health effect." So when nuclear industry workers are signed up for a job in a nuclear power plant, they know that by law they are protected by that limit. And presumably if this is breached they are entitled to seek recourse in the realm of litigation, if they can afford it that is. According to bloomberg.com the Fukushima Dai-Ichi plant offered $11 an hour for full-time maintenance work just a week prior to the 11.3.11 earthquake - the same as McDonald’s pays for part-time work in Tokyo. So what have we got here? According to Kyodo news “The limit was lifted from 100 millisieverts to 250 millisieverts” in March 15, 4 days after the earthquake and Tsunami hit Japan. This was announced by the Ministry of Health, Labour and Welfare at the request of the Ministry of Economy, Trade and Industry, which has the Nuclear and Industrial Safety Agency under its authority. My interpretation - put in other words; The increase in permitted radiation exposure, presumably makes it lawful for government to push employers to force workers into working longer hours accepting higher radiation exposure and the health risks associated with it, and possibly without having any legal leg to stand on, if their health is impaired in future, as a result of this increased exposure. Kyodo News questions the wisdom of this decision, calling it a ‘hasty decision’, given that workers will have to handle a wider range of work over an extended period of time; like removing rubble and disposing of contaminated water, in addition to their initial job of restoring the lost power. Of course we would not have known about it, if everyone was in agreement. But it appears they are not! 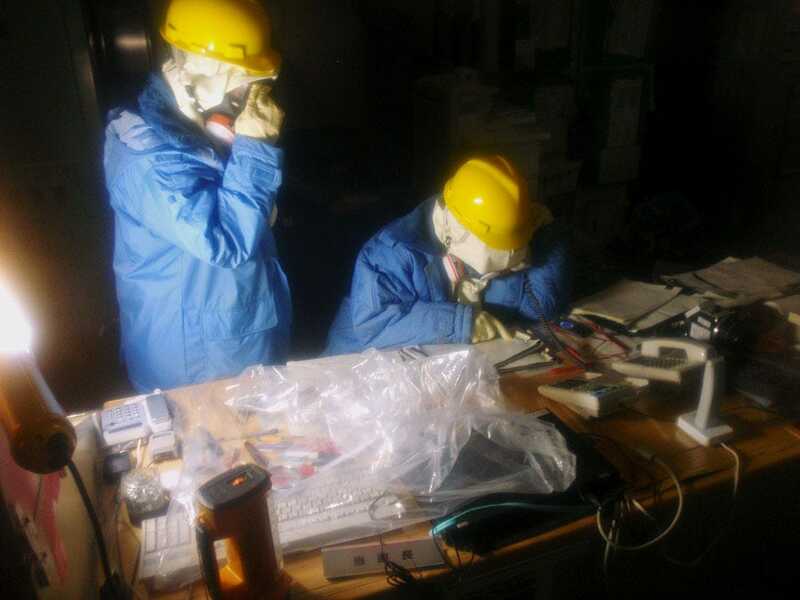 Companies contracted by TEPCO supplying workers to deal with the aftermath of this disaster, refuse to take the risk, saying they are sticking to the normal limit. However the health ministry argues and takes the ‘International Commission on Radiological Protection’ view, which sets the upper limit in an emergency situation to a dose of 500-1,000 millisieverts. Kandenko PR officer said those working at the sites do not agree to accept the suddenly lifted limit. Some were exposed to 173-180 millisieverts. Two workers suffered burns to their feet. ''We have to be prudent. Considering safety, we will maintain the 100 millisievert limit,'' he said. Other companies like; Tokyo Energy & Systems Inc., a TEPCO subsidiary, Construction companies Kajima Corp and Taisei Corp are also said to be sticking to the normal 100 millisieverts limit. This is not the first time Japan had to deal a serious nuclear mishap. In 1999 responding to an accident in nuclear fuel processing plant in Tokaimura, Ibaraki Prefecture, the limit of 100 millisieverts was upheld. Hitachi Ltd. has also adopted a ''200 millisieverts under an in-house regulation,'' According to their PR officer. This is not surprising either, Hitachi Ltd. one of only two nuclear reactor makers in Japan, is reported to team up with US based General Electric Co., is expected to submit its own proposals competing on the contract to decommission the 4 damaged reactors in Fukushima. Toshiba Corp. the other Japanese reactor maker, has already submitted it’s proposed decommissioning plans. Toshiba Corp teamed with U.S. nuclear energy firms including its subsidiary Westinghouse Electric Co., estimating the decommissioning will take only 10 years. Relying on expertise gained from the 1979 Three Mile Island nuclear power plant accident, which took 14 years to dismantle, the Toshiba Corp. proposal, estimates it will take about 10 years to remove the fuel rods, spent nuclear fuel rods, demolish various facilities and improve soil conditions. At the moment there are two other reactors being decommissioned in Japan, those are located at the Hamaoka nuclear power plant in Omaezaki, Shizuoka Prefecture. Decommissioning is planed for completion by 2037 - 26 years from now. Radiation exposure levels for evacuation are reviewed too. So far we looked at ‘radiation exposure limits’ set for workers, but what about residents of near by villages towns and cities? After all they do not have protective clothing, or measuring equipment to warn them when they are being exposed to high levels of radiation. Last week the Japanese government had announced they are ‘reviewing’ the radiation exposure level currently used to designate the evacuation zone around the Fukushima Daiichi nuclear plant. Currently outside radiation levels of over 50 millisieverts require evacuation, and where levels exceed 10 millisieverts residents are advised to remain indoors. Based on the figures, residents within a radius of 20 kilometre of the nuclear plant have been ordered to evacuate and those in the 20-30 km zone have been advised to stay indoors. However the Japanese Nuclear Safety Commission advised the Japanese the government to issue evacuation order if an estimated radiation dose is expected to be of 20 millisieverts over a year, in line with the recommendations of the International Commission on Radiological, which set acceptable dose over a year between 20 to 100 millisieverts in the event of emergencies. Up from the normal time limit of 1 millisievert per year. However in some places local people took matter to their own hands, a village located some 40 kilometres from the plant, recommend - pregnant women and children below the age of 3 should leave to somewhere safer. Edano said “government and...nuclear experts working together must present clear guidelines on from where to where is safe” He added: those leaving their homes, despite being located outside the current evacuation zone, should be eligible for compensation, paid by the plant operator, Tokyo Electric Power Co.